My guess on the names would be Michael Caine characters, Alfie and then Charlie from the Italian Job. Hi Maisie, good to hear from you again. Alfie only has a stubby tail. Charlie is slightly older and looks like a Magpie, albeit slightly smaller. Charlie is feeding himself from a small dish, but he does still yell and beg from time to time. Alfie perches on my hand and flaps his wings while squealing to be fed. he's taking the food from a plastic coffee stirrer. He takes three or four mouthfuls and then turns away, wipes his beak on my leg and then looks for a way to get back to Charlie. They are not siblings but get on very well, They sidle up to one another when roosting overnight. I'll check out 'For The Love of Crows'. Although I've already PM'd you Maisie, just want to say it's great to see you back and thanks for replying; also good luck with your new job. Nice to see you back Maisie. Great to see you, Maisie! I hope you and your family (including the feathered members) are all well. It appears that there are maybe just two fledglings remaining in the garden. I managed to get some pics of one of them being fed earlier today. Mrs HTR is doing most of the feeding. HTR has had a complete personality change and is very nervous. He won't come within 10 feet of me and is always retreating from other birds when competing for mealies. It is still HTR. He does feed the two fledglings and he teamed up with Mrs HTR to 'dit' at a cat in the garden last night. His change in behaviour is most puzzling. I imagine that the youngsters will be left to their own devices before long and Mrs HTR will start up brood #2. 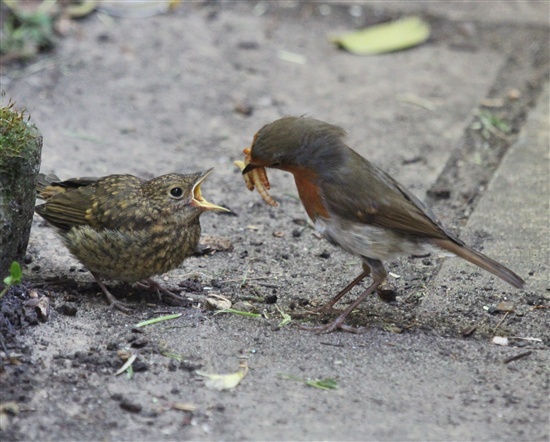 Great pics of Mum feeding baby MC but whatever is wrong with HTR, could he have had a narrow escape from cat or Sprawk! Hope he's less nervous tomorrow with you!